I not only own the dealership, I personally install fences. My friend Rick, brought Protect-A-Child to my attention in 2006. His then boss was selling his distributorship for personal reasons. Rick strongly encouraged me to by the business. 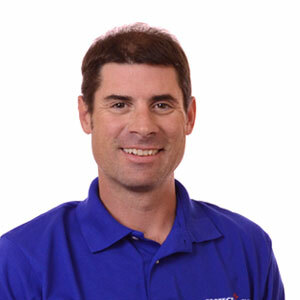 Rick had been installing the fence for about nine years and he trusted the product because of his experiences with replacing the competitor’s fences. He personally replaced their second-rate fence products time and again. He encouraged me to buy because of his passion and belief that all families deserve the best product in protective pool fencing. Protect-A-Child’s fence design was the best in the business then, and I am proud to say as a distributor owner today, it’s still true. Our work style is a little old fashioned, and by that, I mean we keep our word. We try our best to be on time and on budget. I not only own the dealership, I personally install fences. When installing a new fence, I think of the house and pool as my home. We take great pride in doing an excellent job and it always makes us smile when the homeowners say, “wow, it looks better than I thought it would”. No one wants an eye sore around the pool. Our fence design and installers heed that well by getting our clients involved. We include them by sharing a pencil design we draw in the exact place the fence will go. This gives our client the opportunity to change or tweak the design prior to drilling. Contracting projects at home are never fun for the homeowner. They are inconvenient, loud and stereotypically messy. This is where we shine! Our jobs are typically done, start to finish in one day. We leave the home better than we find it, and definitely more secure for kids and pets. Completing installs that include large water features such as waterfalls, spas, or caves are not uncommon for us. We have developed an excellent technique where dirt and sand installation off deck is concerned, and we still finish in one day. We have done many installs for clients that have hilly or treacherous terrain in their back yards, including valleys and drop-offs. Our fencing is not designed for hills, but we’ve developed customized techniques that enable us to secure almost any landscape. Our fence has superior strength across the fencing category. The sections stay tight and will not sag over time. To back this up, we offer a fencing buyback, good up to 10 years worth of use. 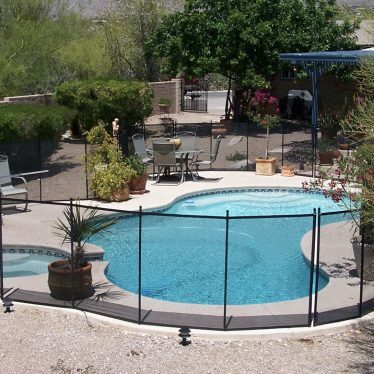 Our fence retains its safety and value as well as resale-ability.